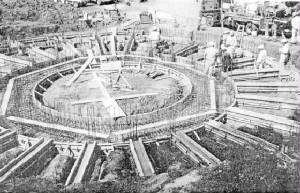 The foundation of a Peace Pagoda currently under construction in Japan. Since the Groundbreaking Ceremony was held in August 2001, the most asked question has been: When will you start work on the Peace Pagoda? There are two answers. The first is, we (collectively, ALL of us) have always been working on the Peace Pagoda. And always will be. Any effort towards peace in this world is work done on the Peace Pagoda. The second answer is: Now! Foundation for the Peace Pagoda will be put in this October. There is plenty of work for all skill levels. And we welcome everyone to visit to share the joy. There will be wooden forms to build, building materials that need to be sorted, organized and moved (no skill needed!) and steel reinforcement bars (re-bar) that will be set in place and tied before the concrete is poured. Also, the ever-expanding gardens can always use some loving attention and the work crews love to eat, so help in the kitchen is greatly appreciated. If you have never built a Peace Pagoda, don't worry. Many of us haven't! But it can be done, so let's join together to build a place of peace as our legacy for future generations.